Violent Streets covers standard yakuza ground: the retired gangster forced back into the crime world. 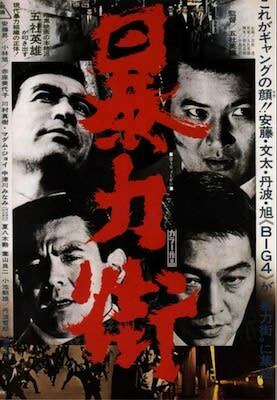 A beef brewing within Tokyo’s underworld sets off a series of spectacular violence headlined by some of the genre's best actors: Noboru Ando, Bunta Sugawara, Akira Kobayashi, and Tetsuro Tanba. Gosha’s skillful delivery prevents the film from losing any sense of seriousness, even at its most violent.